About a year ago, a French Karotz owner called "Slash" contacted me. 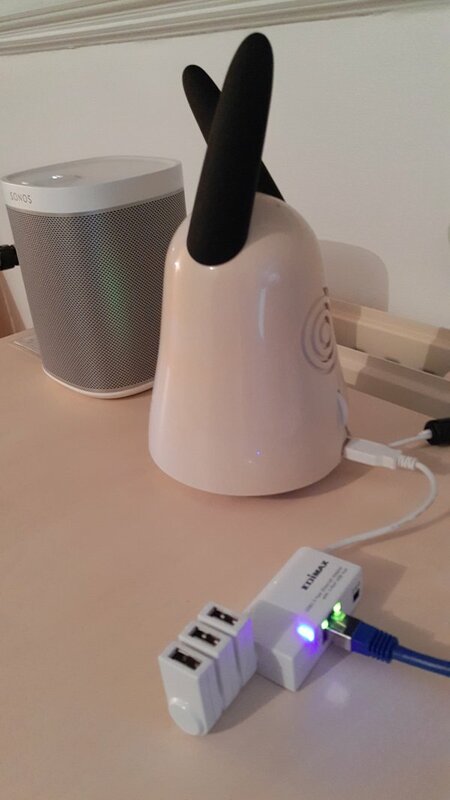 Slash is a Linux expert for 15 years, and has a Home Automation System with his Karotz completely integrated into it. Slash wrote that he is using a wired connection and succeeded in building (cross-compiling) a driver for his hardware. He is using an Edimax EU-4230 USB to LAN adapter. This device also has a three port USB hub, so it will give him three extra USB ports. However, our Karotz has no out-of-the-box support for the Asix-chipset this device is using. So Slash had to (cross)compile a driver, and he managed to add it to the Karotz using INSMOD. Insmod is a program to insert a module into the Linux kernel. This can be done during boot, anywhere in the boot process, as long as it is done before the hardware is actually needed. So for example, when we need a network module, we can insert it into the kernel just before we bring the network interface up. After Slash explained to me how he did this, he send me his compiled driver. I also wanted to try this, but his Edimax device was not sold anymore. So I bought a device with the same chipset. 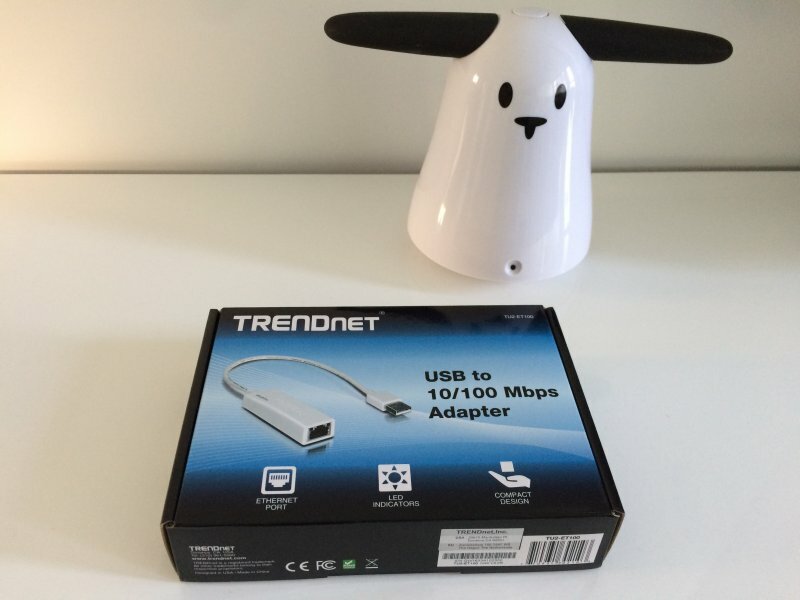 It is a Trendnet TU2-ET100 V4.0R. The appearance of this device is rather similar to many other devices with the same Asix-chipset (AX8817X). This is what I did to get it working: I booted using WIFI with the build-in network device. After booting, I uploaded the driver (asix.ko) to directory /usr/karotz/firmware/ on the Karotz, using FTP (I use Windows and the program WinSCP for my FTP connections). This directory is on the part of the flash-memory that doesn't get erased after boot, so the driver file will stay there, even if you turn your Karotz off and on or disconnect it from its powersource. usb 1-1.2: Manufacturer: ASIX Elec. Corp. I added the commands to get ETH0 up, and assigned network settings (IP, netmask). And there it is, a fully working (wired) network connection using a device that isn't supported out-of-the-box by Karotz. You can download the driver (asix.ko) in a ZIP file from here. We can add more hardware this way, even Wireless USB dongles, which will finally solve the problems caused by the "ARP bug" with the build-in WIFI adapter and driver of Karotz. In part two of this blog, I will explain how Slash provided me with a cross-compiled Realtek driver and we managed to get a TP Link wireless USB adapter up-and-running. Karotz of Slash, with the Edimax USB to LAN adapter. 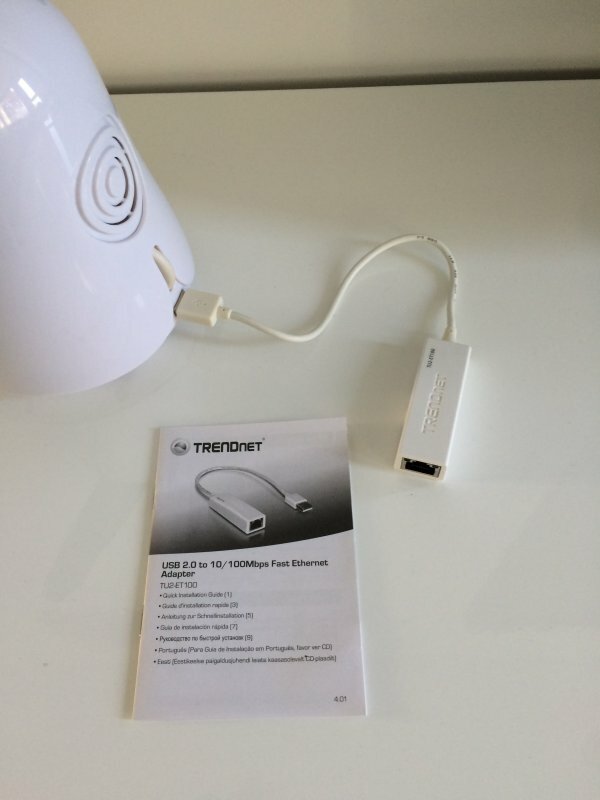 Karotz and the TRENDnet USB to LAN adapter. Karotz and the TRENDnet adapter attached. 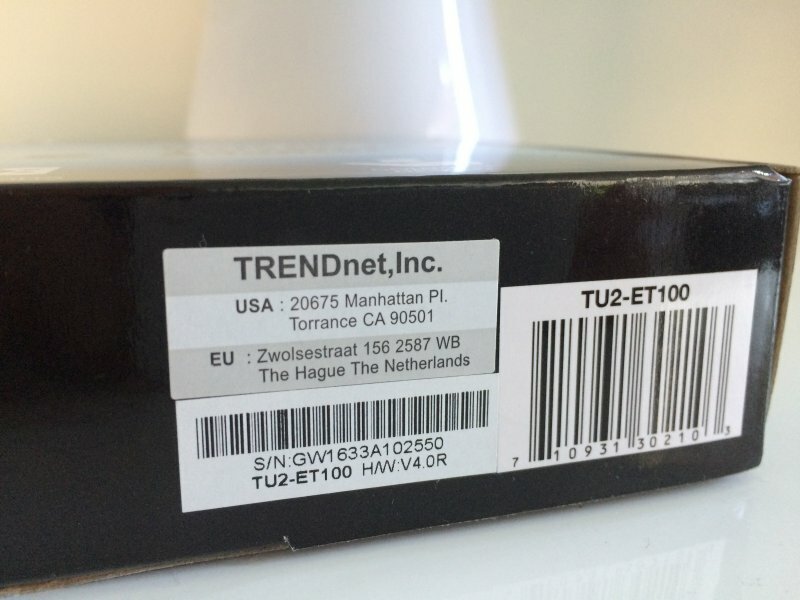 Box of the TRENDnet TU2-ET100 V4.0R Adapter.